With the inbreaking of yet another year, I decided to make some upgrades to my personal operating system, call it HB 2.0, H-Vista, etc. 2006's mid-year adjustment was a smashing success with the addition of Getting Things Done and the Hipster PDA to my skill-set. But HB 2.0 goes to another level. 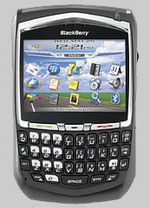 So far this year, it's added snow skiing and now the BlackBerry 8703e to my satchel of tricks. The former resulted after I schooled a bunch of middle-aged people in a level 2 group lesson at Copper. The later resulted after a disastrous 20-hour airport debacle last week that left me out of battery power and out of touch. But then comes this low-flying bullet to knock me off my Shetland pony: evidently some people are jealous.